The flood-lit Hawthorne Bridge crossing Willamette River in Portland at the blue hour before sunrise. 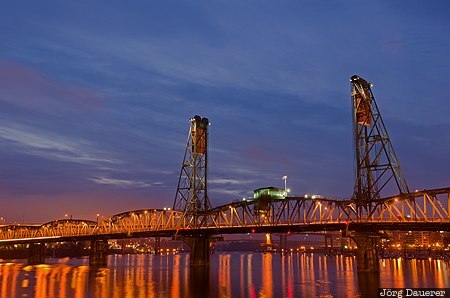 Hawthorne Bridge is a truss bridge with a vertical lift and it is the oldest vertical-lift bridge in operation in the United States and the oldest highway bridge in Portland. Portland is the biggest city in Oregon in the north west of the United States. This photo was taken in the morning of a cloudy day in November of 2012. This photo is part of the exhibition Blue Hour (October 2016). This photo was taken with a digital camera.